Kathryn Dunning, a marathon/trail runner, shares her story of having 2 strokes and finding out about her condition of patent foramen ovale (PFO) closure (a hole in the heart) and the procedure with the GORE® Occluder that has made it possible for her to lead a healthy life without the fear of having a stroke. Neal Howard: Welcome to Health Professional Radio. I’m your host, Neal Howard. Our guest is Kathryn Dunning. She’s a marathon runner and a trail runner and she’s going to share her story on being very young and surviving not one but two strokes and how she survived those strokes, recovered and also how she’s managing life today living a very happy healthy life with the help of some brand-new technology. Welcome to the program, Kathryn Dunning. How are you? Thank you so much for taking the time today. Kathryn Dunning: I’m great. Thank you so much for having me. N: Now, I told our listeners a little bit about you, not a lot – you are a marathon runner and give us a little bit more background about yourself. What is it that you do and where do you do it? K: I am based in Livingston, Montana and I have been working in wildlife conservation for the last 15 or so years and my husband and I run a wildlife filmmaking production company. N: Great. So needless to say, very busy, very outgoing, very active. N: Is that always been a part of your life, a very active athletic and on the move? K: Yes. Absolutely. I was always athletic as a kid. I dance when I was younger. Then I started doing field work in my early 20s and then into my 30s and essentially, we would be out lugging gear for 20, 30 miles a day. And that’s just a happy place for me – is to be moving and active for sure and outside. N: Now, as a marathon runner and a trail runner, you’re active, you’re living your life and then something changed for you, something that most of us don’t even think about until we’re a little bit more in age. K: Yes. I was 35 years old and was really kind of got a little obsessed with trail running and was getting up at 5:00 in the morning and running 10 miles. At the time, I was living in Bozeman, Montana and essentially where I’m located, trails are everywhere. So it’s essentially like running out your door and your log places which is a spectacular thing but I was just 35. I’ve been training hard for a race and I woke up one morning, I just fell off, just really off and everything. My limbs felt heavy and slow and I was running downhill and hit a creek crossing that I had skipped across thousands of times but suddenly, I couldn’t figure out where to put my feet. I couldn’t figure out how to navigate the rocks and I just stood there staring, shocked. Yes. It really set off alarm bells. So I went to see a doctor but going to doctor and saying when I get up and I did my 10-mile run at 5:00 in the morning, I feel really tired and kind of heavy and slow, that doesn’t really set off alarm bells for a lot of doctors because I did it every day. Even though, I felt this way and my vital health at the time was off the charts. So thinking then which actually made sense to me was that maybe I was under some type of stress and needed to relax or needed to maybe take up yoga or go to counseling or something along those lines. And again like I said, I thought that was a very wise advice. So I followed that and kept running and about a month or so, maybe two months later, I went on a fabulous run – 10 miles. I’ve added an extra two because the weather was gorgeous and then I went home and I made dinner, went to bed just like normal. But I didn’t wake up the next morning or at any point the next day. N: You just slept all the way through? K: I slept all the way through and I woke up 32 hours later. It confused me, unable to walk, talk or see straight. N: You’re panicking at this point, I’m sure. K: When you have a brain injury and you’ve lost a lot of time and you’re just in sort of a confused – I was in a confused state. So I was trying to figure out what had happened. Finally, I had just called a friend and got a ride to the ER. … then an MRI later, they would tell me I had a stroke. In fact, they could see on the MRI that it was my second stroke. So my worry over that strange heaviness and the spatial confusion was the first lesser warning stroke to this bigger, more devastating one. N: So you had survived one stroke. This one put you to sleep for 32 hours. You finally go to the doctor and realized that you’ve had two strokes. N: And none of these symptoms other than being a little bit tired and feeling off. K: Yes. At 35 being tired and feeling off is not an unusual thing. There isn’t anything that’s striking about it. It was like, “Okay. This is a bit much. I should probably look into this.”, but it wasn’t anything that these are stroke warning signs. N: You say nothing was ringing any alarms when you said you were feeling this way, that way the other and you’re not the only person who goes to the doctor feeling the way that you’re feeling and certainly not the only person who survived a stroke after being told, “Ah, it’s just a little bit of stress. Maybe you’re running too much.” What was it that caused you to become your own health advocate? N: What was the cause? 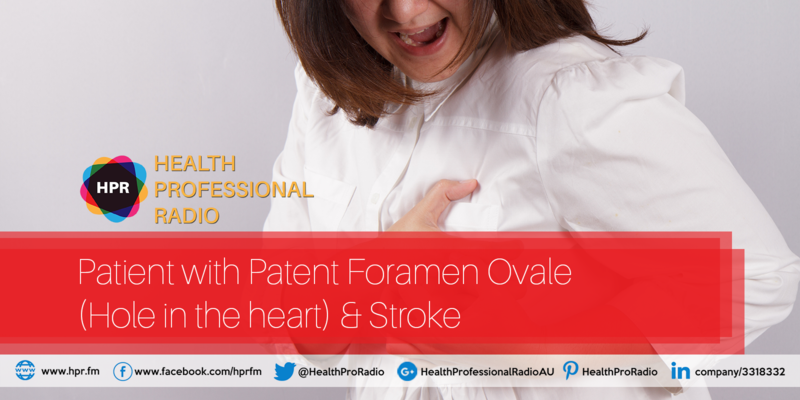 K: The cause of the stroke was a patent foramen ovale. It’s a PFO. In utero, all infants have a hole with a flap-like covering between the two upper chambers of the heart that allows blood-rich oxygen from the mother to bypass baby’s lungs. Then after birth, the flap-like covering typically closes but in about one out of four people which is quite a bit and that’s globally, that people (crosstalk) this hole remains open. A PFO creates no symptoms and requires no treatment in a lot of people but I was one of the unlucky few in which the PFO allowed blood clots to pass from the right side of my heart to the left and it opened a gateway for the first stroke. N: I’d be terrified that I would suffer another stroke and that would be the one that would maybe disable me. How are you managing today and not living in fear of another stroke? Has this PFO been repaired? K: Yes. That’s exactly what made me become a big advocate for my health. It was exactly that fear. Two strokes were enough. That second one was pretty devastating and very hard to recover from and took a lot of work and I was determined never to have another one again and so I was given the option of blood thinners alone or an occluder. I chose to have the GORE® Occluder placed in my heart to block that hole. N: Where can we go and learn some more about the GORE® Septal Occluder? K: GORE® has a website, goremedical.com. N: Kathryn Dunning, it’s been a pleasure talking with you. A great and an inspiring story and I understand that you’re living a healthy life and raising a family and all the things that go along with no fear. K: With no fear. Yes and that’s the wonderful thing about this whole process that I’ve been through. N: Well, I’m hoping you’ll give us some updates in the future and I thank you for taking the time with us today. N: You’ve been listening to Health Professional Radio. I’m your host, Neal Howard. Transcripts and audio of the program are available at healthprofessionaradio.com.au and also at hpr.fm. You can subscribe to this podcast on iTunes, listen in and download at SoundCloud and be sure and visit our affiliates page at hpr.fm and healthprofessionaradio.com.au.